If you missed the first part of Elizabeth's story, please click here. Elizabeth settled into her bed in the Cook Children’s Pediatric Intensive Care Unit. They hooked her up to machines to monitor her vital signs. They put a small tube down her nose to help her to get food and nutrients. They had a ventilator ready in case she started having difficulty breathing. They propped her very weak, very flimsy right arm up on a pillow. Everyone watched her. The intensivists, the neurologists, the infectious disease doctors and I all 1-2 days held. Would she stop breathing? Stop being able to swallow? Lose more bodily function, as so many other children afflicted with this awful disease had? Would her right arm, torso and face become permanently weakened? There is no treatment for acute flaccid myelitis. None. Doctors have tried steroids, antiinflammatories, immune system medications, antivirals, antibiotics - and nothing changes its course. So we just had to wait. And see. And support her. And you know what? She didn't get worse. The next few days in the ICU lead to no changes. She had peaked. Plateaued. She started sitting up. Watching TV. Talking more. The arm and face weakness persisted, but she was able to move around more. Her neck was still very painful...but it was more tolerable. She was transferred to the rehabilitation unit at Cook Children's and for the next month worked with the pain management doctors, physical therapists, speech therapists, and occupational therapists who all wanted to help her regain her old abilities. Elizabeth's family is a close-knit group of kind, fiercely loving people with strong faith. They were with her every step of the way and drove miles to be with her. They prayed daily. I truly believe this played a huge role in Elizabeth's amazing success. When I visited Elizabeth in the hospital, there were never less than 4 or 5 family members in her room. This spoke worlds to me about the healing powers of faith, and love. This past weekend I watched Elizabeth compete in the Cook Children's "Tri My Best" Triathlon, which was put on by the Cook Children's Rehabilitation team. I got to watch her shine as she biked, ran, and - her favorite - swam alongside other children who have been fighting their own battles. I watched this little warrior with tears in my eyes. Aren't children amazing? Their resilience, hard work, honesty, and unfaltering faith is something we could all learn from. I hope you have enjoyed Elizabeth's story. I didn't write it to scare you, or make you worry. The truth is, less than one in a million kids get this disease. And no matter what the headlines say or what social media says, it's very rare and unpredictable. None of Elizabeth's close family have gotten sick, though I am sure one or more of them may have come in contact with the virus that we think causes this. I wrote it because I am proud of my hospital system. 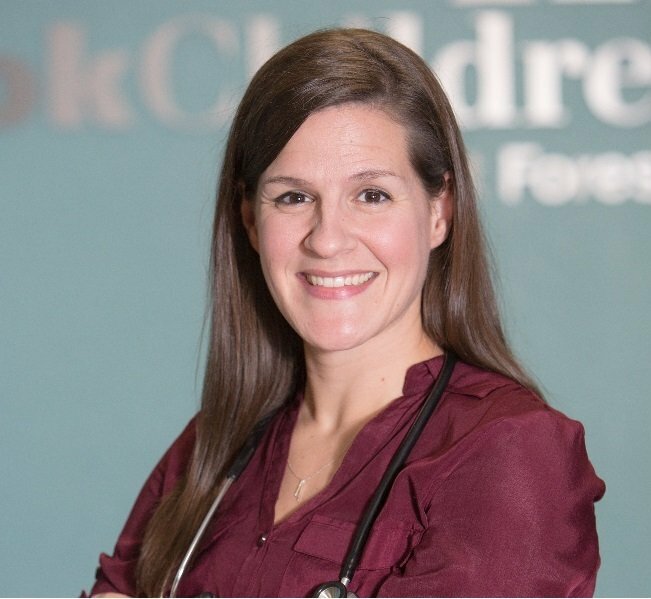 Cook Children's has a phenomenal team of ER doctors, radiologists, intensivists, infectious disease doctors, therapists, nurses, neurologists, and pain doctors that came together to help Elizabeth. I am proud and honored to be in their company. I wrote it because I think Elizabeth is an amazing child. She is strong, determined, and has an unfaltering spirit. I wrote it because I love her family. Her family's actions are a shining example of what love and faith can do for a child's health. I've typed up her story so that a worried parent somewhere, sometime, sitting in an ER, can have something to read, and gain hope from, and learn from.